Columbus has been ranked the "highest in visitor satisfaction in the Midwest", by J.D. Power* on the 2016 Destination Experience Satisfaction StudySM. This first-ever study measures overall satisfaction among visitors to the top 50 U.S. travel destinations for business or leisure based on six factors: activities, cost and fees, food and beverage, infrastructure, lodging and travel/arrival. Columbus scored 799 points on a 1,000-point scale, performing particularly well in the infrastructure; food and beverage and cost and fees factors. We have been working hard for years to earn an accolade such as this. 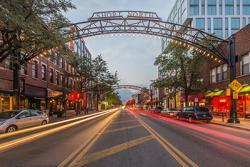 Over the past decades, Columbus has developed into a city with interesting and walkable neighborhoods, wonderful culinary experiences, a rocking nightlife scene, world class attractions, unique and high quality local products and outstanding accommodations. We&apos;re delighted that visitors are discovering our emerging destination and are highly satisfied with their trips here! For three years, attractions and activities, hotels, transportation providers, facilities and event venues, local government and civic organizations and restaurants have all been working together through our Experience Dedicated Destination (EDD) program to capture data from visitors about their Columbus experiences. In return, the data we&apos;ve collected is being used to inform and direct community-wide efforts to ensure a positive visitor experience at every touch point. Whether you are just here for your conference, or you decided to stay and explore, we hope that you see that we value your visit. We&apos;re right here with helpful tips and info for you and your conference attendees! For more information about the 2016 Destination Experience Satisfaction Study, visit http://www.jdpower.com/resource/destination-experience-satisfaction-study.